Social Enterprises: A Solution to Employing the Hard-to-Employ? [Princeton, NJ] Social enterprises might be one part of the answer to combating poverty in the United States, according to a new study by the New Jersey-based Mathematica Policy Research. The research conducted by Mathematica evaluated social enterprises in California and found these public/private businesses increased employment, decreased dependence on government and increased the likelihood individuals had stable housing. The study looked into seven social enterprise organizations that were supported by the private non-profit Roberts Enterprise Development Fund and the federal government’s Social Innovation Fund. These groups aim to assist people that want to work, but struggle to find and keep a job because of different everyday challenges. These include homelessness, mental illness, previous incarceration and others. While the government’s welfare programs have failed many of these hard-to-employ individuals, social enterprises have found tremendous success. 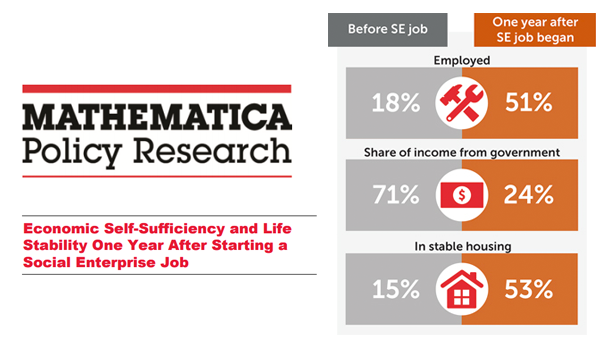 “Mathematica’s evaluation found that social enterprises may help people find jobs, move toward economic self-sufficiency, and improve life stability,” the study reads. One year after the individuals started their jobs with the social enterprise groups, employment increased from 18 percent to 51 percent. Wages and salary were up 268 percent, while their share of income from government dropped from 71 percent to 24 percent. Also, the amount of workers that had stable housing jumped from 15 percent to 53 percent. The report did find the social enterprise businesses operated at a small loss during the time of evaluation, and the workers were no better off financially because their increase in earned income reduced their government benefits. Even though their income was essentially static after one year, taxpayers carry less of the burden, and the social enterprises assist with training to better prepare the workers for future employment, which would likely have higher wages.